The automatic transmission in your vehicle should be serviced at manufacturer’s recommended service intervals, However if you do a lot of heavy towing you may need to service the automatic transmission more regularly. 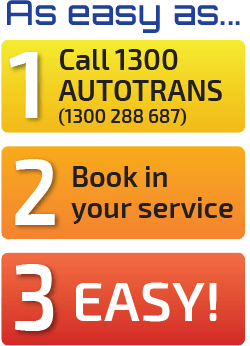 If you are unsure, consult your nearest 1300AUTOTRANS Service centre today. They will be able to advise you of the condition of the transmission fluid and the operation of the transmission. Handy Tip: Remove the transmission dip stick and wipe the transmission fluid residue from the stick onto a piece of white paper. If the fluid appears a dirty or burnt brown colour, your transmission requires attention. At 1300AUTOTRANS centres we offer three different transmission services. Test drive the vehicle for smooth & correct operation of the automatic transmission. We then on electronic transmission controlled vehicles check the diagnostic system for any faults. Your vehicle is then lifted on a hoist and we remove the service drain plug allowing removal of the fluid. We then replace the service plug along with a new sealing washer and refill the transmission with the correct fluid and level. The vehicle is then driven again checking for the correct operation. Warning: Never attempt to change the transmission fluid yourself unless you know the correct fluid type for replacement. incorrect fluid replacement can seriously damage your automatic transmission. Some newer vehicles have removed filler ports to prevent this from occurring as transmissions are expensive to replace and topping up the transmission with the incorrect fluid will cause damage to seals and clutches dramatically reducing its operating capacity and life. Automatic Transmission Fluid, Filter Gasket, Replacement, Band And Kickdown Cable Adjustment If Necessary. We then scan the computer for any trouble codes. Your vehicle is then carefully lifted on the hoist and prepare the transmission pan for removal. The drain Bung is then removed and the fluid is checked and disposed of in accordance with strict environmental laws. If bands are able to be adjusted this is then carried out to the manufacturer’s specifications. The old pan gasket is replaced and the pan is then bolted back to the gearbox housing with a new gasket. We then refill the transmission using the correct fluids recommended by the vehicle manufacturer. Over recent years transmissions have been incorporated into the vehicles on board computer system, This ensures the best possible life for the transmission if it is serviced at the intervals recommended by the manufacturer. Should the transmission be serviced incorrectly the computer may inhibit the transmission from operating to the best capability, causing you a loss of power and an increase in operating costs I.E Fuel consumption. Automatic Transmission Fluid, Filter, Gasket, Replacement, Band And Kickdown Cable Adjustment If Required Plus System Full Flush. Your vehicle is then carefully raised on the hoist and prepared for the transmission pan to be removed. After the area has been spotlessly cleaned, the pan bolts are then unscrewed allowing for the removal and inspection of the internal base of the pan for metallic deposits. The old pan gasket is replaced and the pan is then bolted back onto the gearbox housing with a new gasket. We then refill the transmission using the correct fluid as recommended by the manufacturer. Once the transmission is at the correct fluid level our transmission power flush machine is then connected to the transmission and all of the oil from the torque converter and cooling system is completely replaced with new oil. At this point any throttle cable adjustments can be made where applicable. Did you know: 90% of all automatic transmission failures are due to overheating and fluid contamination? A 1300AUTOTRANS Transmission flush service safely removes virtually all transmission life robbing dirty fluid and contamination, A typical transmission service only replaces 40% of your transmissions contaminated fluid. A 1300AUTOTRANS transmission power flush replaces over 95% of used fluid and protects your transmission with fresh automatic transmission fluid and conditioners that revitalises the seals ands o’rings which leads to longer transmission life better fuel economy and performance. What are the benefits of a 1300AUTOTRANS Transmission power flush? It is advisable to have it inspected and reported on as soon as possible as early detection and repair will reduce the risk of further damage. An automatic transmission is the most complicated system in your car. everyone knows of a horror story about the cost and headaches associated with transmission problems and dreads the day it might happen to them. Since you’re reading this, we assume that day is here. Morning drop off and afternoon pickup service. All exchange transmissions carry all of the same specifications as the overhauled transmission but the biggest advantage of the exchange transmission is the time factor, in most cases your vehicle can be back on the road the same day!. with everything from a tow pack to street and strip whatever your heart desires or your sport requires we’ve got the combination for you. So if you are experiencing automatic transmission slippage or noises follow the link below to book in and find out whats wrong and how much to fix it.